The Tippecanoe County Courthouse (1884), designed by local architect James F. Alexander, remains the most architecturally important building in Lafayette, Indiana. Founded in 1825, Lafayette, Indiana, (population 60,500), lies on the Wabash River amid the rich agricultural lands of the Wabash Valley. By 1843 the Wabash and Erie Canal had reached Lafayette, which helped promote its expansion. Just 10 years later, the first train pulled into the city. The railroad enlarged the farmers’ markets and led to economic expansion, the start of manufacturing, wholesale trade, and meatpacking. To support the expanding population, the Tippecanoe County Courthouse, designed by Lafayette architect James F. Alexander, was completed in 1884. Architecturally it remains the most important building in Lafayette. The founding of Purdue University in West Lafayette in 1869 also contributed to Lafayette’s growth. 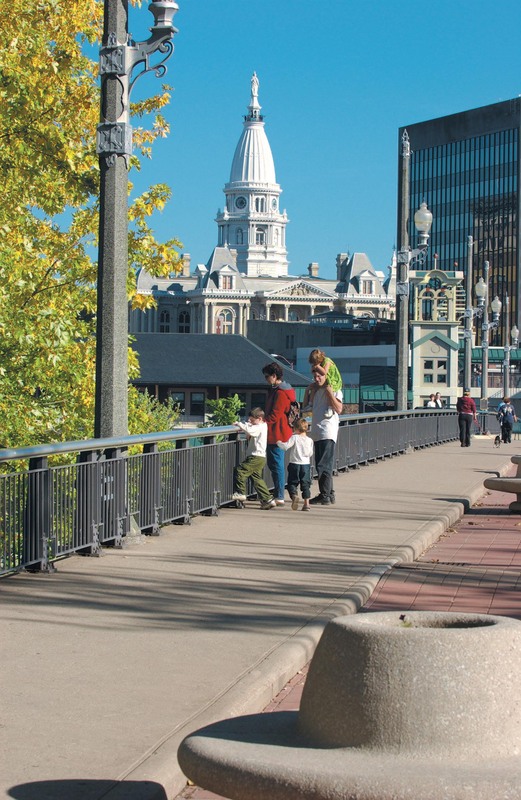 In 2001, the railroad tracks that ran directly through the city were relocated. At the same time the 1902 Big Four Railroad Depot was also relocated and restored for use by Amtrak and the city trolley. Lafayette has five historic districts, and visitors can take self-guided walking tours of the courthouse, residential neighborhoods, houses of worship, and the historic downtown. Historic attractions include the Moses Fowler House, built in 1852, and the Tippecanoe Battlefield Museum, located on the site of the 1811 Battle of Tippecanoe between troops led by William Henry Harrison and the forces of Tecumseh. The 1937 Art Deco Lafayette Theater was restored in 2006 and is used for a film series, concerts, and community events. Fort Ouiatenon Historic Park, site of a fur trading outpost in the mid-1700s, hosts the annual Feast of the Hunter’s Moon, a re-creation of a yearly fall gathering of French traders and Native Americans at the fort. Participants enjoy a reenactment of 18th century living.